Hosting the Olympics in Beijing provided us with a variety of interesting opportunities ...maybe I'll write more about those later. My favorite opportunity...okay aside from the Japan vs USA baseball game with the boys...my other favorite opportunity was meeting Rene Flemming. She came to Beijing as part of the Cultural Olympiad. Rob worked diligently to arrange a web chat with her and invited me to attend. What an honor to meet her. We mentioned to her that I was looking for a voice teacher in Beijing. She very graciously put us in contact with her friend from Juliard, a famous Chinese mezzo-soprano named Ning Liang. Tuesday was a real priviledge. 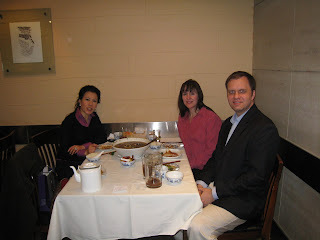 Ning Liang hosted us for lunch at a delicious Sichuan restaurant. We felt so honored! We are planning a lesson for the coming Tuesday. I'm quite excited. After lunch I raced back (well I was in a taxi) to Shunyi to get Caitlin ready for Mommy and Me dance. Then I met Kyle at the bus to remind him about swimming lessons. I was met with a huge protest. Hmmm... what to do about that? Maybe I'll switch teachers. I went back home to get Mary ready for ballet, give Ben some money to go buy a disposable camera for his field trip, and then headed back up to the clubhouse for Mary's class. Grant, Caitlin, and Olivia came with me. We bought some bananas to make change for the swimming teacher. I caught up with Sam who got off the five o'clock school bus, gave him a banana and his swimsuit and then, after a few minutes of playground time, it was time to go back in and collect Mary. We got some popsicles from the little Jenny's, then they all climbed in the red wagon and I pulled them home. I thought...maybe I need to do something about Tuesday afternoon. Its pretty hectic. that's exciting news! I can't believe you had so much going on in one day.. haha.. I think I would have had the kids pull ME home in the wagon =) I love hearing you sing by the way and I think the kids in the background makes it all the more authentic! Megan this is amazing! I knew you could sing but I don't think I have ever heard you. I'm glad you appreciated the authenticity. I'm trying to keep my sound files honest-to-goodness with no editing. I had to admit that I cut out a certain tantrum. MY OWN! You can hear a little interruption in the Italian aria. You would have loved it Miriam. Mary kept interrupting me and I forgot the cheerful and loving part of firm but cheerful and loving. Sam said I should put it on Facebook...I don't think so! Thanks for your nice comments ladies.